The WSU School of Music will celebrate the season with its annual Holiday Concert, “Joy to the World: A Global Holiday,” 2 p.m. Saturday, Dec. 1, in Bryan Hall Theatre. The concert will include seasonal favorites and conclude with Leroy Anderson’s Christmas Festival, featuring all of the performing groups. Tickets will be on sale at the door beginning 45 minutes before the concert. Prices are $15 general admission, $10 for students and senior citizens, and free for children 12 and under. This concert is family friendly and the perfect start to the holiday season! The WSU Concert Choir, also conducted by Wiest, will perform “Trinity Te Deum” by Eriks Ešenvalds, featuring School of Music faculty on trumpets, trombones, organ, piano and timpani. “Jingle Bells,” an arrangement by David Willcocks of the popular song, will be followed by a traditional Canadian carol, “Huron Carol,” arranged by Dan Forrest. They will conclude with “Here We Come A‑Caroling” arranged by Josh Sparkman. The pianist for the Concert Choir is Miles Sutton, a graduate student pursuing the MA in Music. The WSU Tenor/Bass Choir, directed by Dean Luethi, will perform the Spanish carol “Riu, Riu, Chiu” arranged by Linda Spevacek, as well as Michael John Trotta’s contemporary arrangement of the traditional hymn “O Come, O Come, Emmanuel.” The WSU Treble Choir is directed by Chris Nakielski, a new faculty member within the Voice/Choral Area in the School of Music. The WSU Symphony Orchestra is under the direction of Danh Pham. 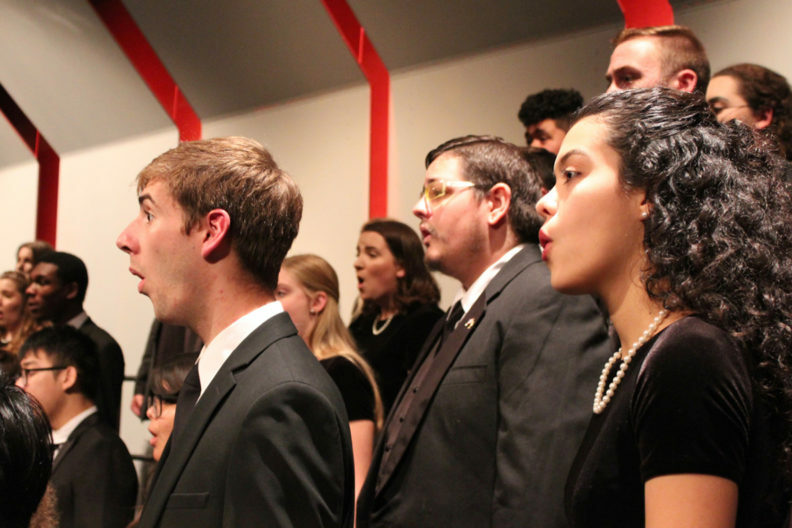 The WSU Madrigal Singers and Concert Choir will be performing at the Leavenworth Tree Lighting event, 3 p.m. Sunday, Dec. 2, on the main stage in the center of town. Coug supporters are invited to join the celebration and wear their Cougar gear.